The inland bearded dragon (aka bearded dragon), Pogona vitticeps, is an extremely popular pet, both here and abroad. However, wide availability does not signify that this lizard should in any way be “taken for granted” – it is a fascinating animal, and recent research has uncovered startling facts about it. As is true for even the hardiest of lizards, the bearded dragon also has very specific needs, which must be met if it is to thrive as a pet. Younger hobbyists may be surprised to learn that this species was virtually unknown in the USA, even in zoos, not long ago. As a youngster, I knew it only from the occasional photograph, and longed to view one in the flesh. Today, the inland bearded dragon is a pet trade staple, with thousands being bred by hobbyists each year. Oddly enough, all pet trade animals seem to have originated from a small group smuggled out of Australia (where they are strictly protected) to Germany in the early 1980’s. They are legal to own in the USA, but, technically….. In 2005, researchers at Australia’s Melbourne University discovered, much to the surprise of the herpetological community, that the bearded dragon has glands that produce mild venom. Apparently harmless to people, the venom seems to be holdover from the distant past. Bearded dragons are the only members of their family, the Agamidae, thus far known to produce venom. Several unrelated lizards, such as the beaded lizards, Helodema horridum, Gila monsters, H. suspectum, Komodo dragons, Varanus komodoensis and lace monitors V. varius, also produce venoms of varying strengths. The inland bearded dragon is found in central Australia and in non-coastal areas of eastern Australia. Six additional species range throughout the continent and into New Guinea. It favors dry savannah and scrub, semi-deserts, rocky outcrops and open forest. Although a ground-dweller, the bearded dragon climbs well and uses rocks and stumps as basking sites and as platforms from which to launch attacks on insects moving about below. Diurnal, it basks at temperatures of 125 F for short periods and shelters in self-dug burrows during extremely hot or cold weather. Although often passed by in favor of more brightly colored lizards, the sheltopusik, or Eurasian glass lizard, Ophisaurus (Pseudopus) apodus, makes an interesting, hardy and responsive pet. One formerly under my care at NYC’s Staten Island Zoo is approaching 30 years of age, and still in vigorous good health. The captive record is 54 years (the longest, I believe, of any lizard), and longevities of 20-30 years are not uncommon. Furthermore, the sheltopusik is uncommonly responsive (especially to those who provide its meals!) and accepts a wide variety of foods – pink (new-born) mice, crickets, earthworms, mealworms, waxworms, eggs, canned lizard diet and canned dog and cat food – to name a few. Cone-shaped teeth assist in crushing snails, a favored prey. After eating snails, sheltopusiks remove the snails’ slime from their jaws by rubbing their mouths against the ground. In the wild, they actively forage for beetles, spiders, grasshoppers, caterpillars, mice, shrews, voles, ground nesting birds and their eggs, small snakes, lizards and their eggs, and carrion. Averaging 2-3 feet in length, exceptionally large specimens can top 4 feet. Glass lizards, as their name implies, quickly autotomize (shed) their tails when handled or captured by a predator. The eastern glass lizard, O. ventralis, of the southeastern USA and Europe’s slow-worm, Anguis fragilis (note the species’ name!) are particularly adapt in this regard. Pet sheltopusiks usually become so tame that tail shedding is rarely a consideration if they are handled gently. The black ratsnake, Elaphe alleganiensis, found throughout much of the eastern half of North America (even in NYC, on occasion, and its suburbs), is a pet trade staple. Hobbyists have developed a number of unique color morphs, including albino individuals, and frequently hybridize this snake with related species. Since so much is known of its natural history and captive care, I thought I would note here some recent changes regarding its relationships to similar snakes. The taxonomy of the genus Elaphe is confusing due to a wide variation in the appearance of individuals of the same species, and to the fact that the various species and subspecies inter-breed where their ranges overlap (one reason for the ease in creating different color phases in captivity). Most snake enthusiasts grew up knowing the black ratsnake as Elaphe obsoleta, but that name is a now assigned to the Western ratsnake, with the black ratsnake being re-named as E. alleganiensis. At least 11 species of snake of the genus Elaphe are found throughout North America. To add to the confusion, black ratsnakes living from North Carolina through the Florida Keys vary greatly in appearance from northern populations, being various shades of yellow and orange in color instead of black. Formerly classified as distinct subspecies, known as Everglades ratsnakes and yellow ratsnakes – both also quite popular in the pet trade – they are now considered to be merely local color variations of the black ratsnake. The black ratsnake frequently shares hibernation dens with rattlesnakes and copperheads. In some parts of the country it is known as the “pilot blacksnake” or “rattlesnake pilot”, in the mistaken belief that it guides rattlesnakes to their winter retreats. The largest individual on record measured 8 ½ feet long. The diets that you provide your reptile and amphibian pets are of critical importance in maintaining their good health and longevity. Providing a balanced diet can be a quite simple matter for some species and, unfortunately, nearly impossible to achieve with others. Proper nutrition plays an important role in every aspect of your pet’s life, from its ability to grow normally and reproduce to less obvious areas, such as the functioning of its immune system. 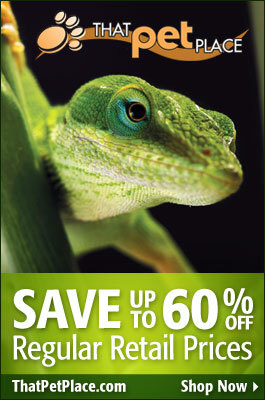 Reptile and amphibian hobbyists today have a wide variety of both prepared and live foods from which to choose when formulating a diet. In most cases, this is a very good state of affairs. However, sometimes it has a tendency to make us a bit lazy — for example, is very easy to provide an insectivorous lizard with a diet based on one or two readily available food items when, in actuality, the animal may need a great deal more variety to maintain optimum health. What I would like to do in this article is to present some general principles and ideas for your consideration. Please bear in mind that actual feeding techniques – how to present the food — will also affect the ultimate value of the diet that you provide. For example, the length of time between a food animal’s introduction into the terrarium and when it is actually eaten will affect how much of its vitamin/mineral supplement coating will be passed along to your pet. Whether food insects will live or die within the terrarium, and how to keep track of the food intake of secretive or nocturnal pets will also affect the manner in which you must present the food. All of these factors, and many more, will be addressed in future articles. Until then, please contact me with your questions and observations on this subject. There are two basic approaches to feeding reptiles and amphibians in captivity. One method is to identify one or two commercially prepared diets that provide all of the nutrition that your pet needs for a long and healthy life. This option is available to those who keep animals, such as tortoises and newts, that normally consume, or will accept, non-living food items. Animals that consume live prey in the wild will generally need a varied diet in captivity (one notable exception is most of the commonly kept snakes, all of which do quite well on a diet composed entirely of rats and mice. Those who keep or observe frogs soon learn of their prodigious appetites. Surely the champion Anuran eater must be the African bullfrog, Pyxicephalus adspersus. Native to southern Africa, this brute is a popular pet, and with good reason – captive longevity is said to approach 50 years. Two animals that I know of, kept in separate enclosures by the same person, both expired at age 21, in the same week. The most memorable “frog-eating footage” I’ve seen focused on African bullfrogs in the Etosha Pan, northern Namibia. One enormous animal swallowed a centipede of at least 10 inches in length, which bit the frog numerous times on the way down. Another frog latched onto an emperor scorpion, which also did its best to make itself a “memorable” meal. But a note I read in an African nature journal tops all – a huge male frog burrowed into an outdoor cage at a South African snake park and was, when discovered, in the process of swallowing his 17th baby spitting cobra! All of this eating results, as you might imagine, in frogs of impressive proportions – a male at the Fort Worth Zoo measured 10 inches from snout to vent and 9 ¾ inches around – a near perfect circle! His weight surely topped 5 pounds, but I do not have the exact figure. Our own American bullfrog, Rana (Lithobates) catesbeianus, offers its African cousin some competition. While working at the Bronx Zoo, it became my habit to toss crickets to the bullfrogs that had colonized a small artificial pond. The frogs became bold in time, and visitors enjoyed the show. On one occasion a bullfrog’s leap for food brought it directly in front of another. The larger animal grabbed the smaller, who was fully three quarters his size and, in front of 50 or so second-graders, proceeded to jam the squirming neighbor down his massive gullet. I observed this fellow thereafter – his noticeably distended abdomen flattened out in two days, after which he again gobbled crickets with enthusiasm!